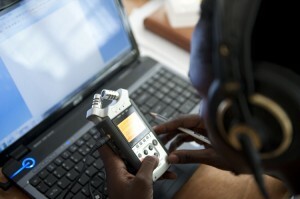 Photo illustration by Internews Network – used by permission under Creative Commons. If society and journalists had not viewed and reported on many groups in our society with bias, the press would not have to step so carefully today. Though the impact to journalists can’t be compared to the results that prejudice has had on the people who society discounted, its effect on reporters will be felt across the globe for decades. 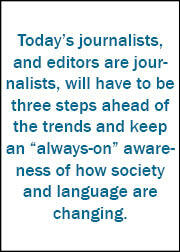 Today’s journalists and editors will have to be three steps ahead of the trends and keep an “always-on” awareness of how society and language are changing. New language standards and journalism requirements evolve out of social change. These will be our new guides to survival in this fluid world. Our Western society was set-up to venerate Anglo-males, and language and customs developed to uphold that “ideal.” As a result, those who didn’t fit that category were marginalized, some to a greater extent than others. Even journalists, ostensibly objective, have fallen prey to bias. In the early 1900s, yellow journalism reigned as Hearst and Pulitzer battled for press supremacy, and the lure of profit. Before and during the Civil Rights Movement, many African-Americans were portrayed as criminals, and as lesser citizens than their Anglo counterparts. Journalism today needs to be aware of where it has come from, if it is to reflect multiculturalism and maintain high ethical standards. Journalism should represent all members of society, without prejudice. To do this, we must be aware of what terms are pejorative, and use neutral terms instead. Today, getting terms right is a greater challenge than before the Internet forced the news media to reinvent itself. Now, with copy editors out the doors at many news outlets, the reporters on the street are left to not only gather the news, but to edit their own work – or to not edit their own work, as often is the case. We will be challenged to provide accurate content that is descriptive when necessary, but avoids portraying some in an unfavorable light that smacks of old stereotypes. How will we cover stories about older drivers who may have slower reaction times, diminished sight and hearing? Must we skirt the issue? Will we have to discuss drivers with these characteristics without mentioning age as a contributing factor? What of census data that shows Asian-American students at the top of their classes? How can we address this without mentioning, um, they’re Asian-American? Today’s journalists who want to maintain high-ethical standards and objectively report on issues that impact our society will have to fight the negative image of the news media that some news consumers have. By carefully reporting news that reflects reality without bias, we have the opportunity to redeem our collective reputation. But we will also struggle to have our voices heard, as the media scrambles to monetize its Internet presence. If profit remains the goal, then unbiased reporting may be a casualty, and reporters will continue to discuss what female public figures are wearing, rather than their positions on the issues. So we must fight to find a middle ground: one that is without bias, accurately represents our community, and is unafraid to tackle controversial issues. If we sacrifice this on the altar of political correctness, we will cripple our reporting and feed news consumers only generic pabulum. Melanie Rice is a journalism student at MSU Denver, with an emphasis on both visual and written content. The Society of Professional Journalists – What Is It?